Mubashar has been in the industry for a while. He was accepted to Seneca College for program in Opticianry in 2007 and graduated in 2010 with Honours. Following graduation he worked with famous optical stores as a "Licensed Optician and Contact Lens Practitioner" with additional responsibilities of Manager. But, he always had a quest to server people without any boundaries and limitations. In July 2011 he started his own company "Lensmatic Optical Ltd" with the belief, commitment and enthusiasm to serve customers at his best. After 3 yeas he added a 2nd location in The Center Mall-Saskatoon. Now, 2 Licensed Opticians, 2 Student Opticians and an Optometrist are working as a team to fulfill the dream of serving their clients at the extreme level of expertise. All Opticians are registered members of College of Opticians, Saskatchewan and Optometrist is a registered member of College of Optometrist, Saskatchewan. 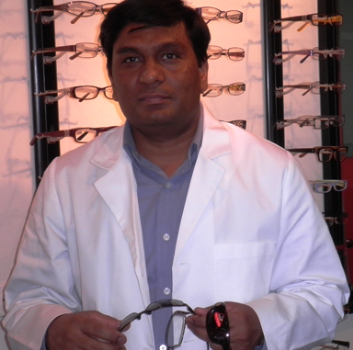 Zulfiqar, co-owner of Lensmatic Optical is a Licensed Optician and has an immense background in business and management is taking the company to new horizons. He is registered member of College of Opticians Saskatchewan. Beside this, he has done Masters in Biological Sciences.